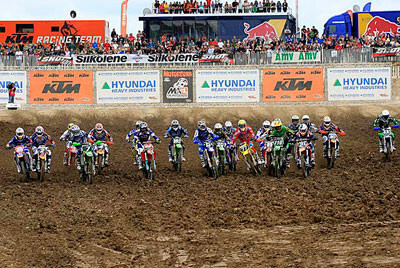 FUNCHAL (PORTUGAL), 15 July 2008 – The FIM Motocross World Championship goes back to South Africa this weekend for the tenth round of the season. Two years after its latest appearance in the country which saw legendary Stefan Everts race his last South African GP, the series has now David Philippaerts leading the MX1 standings with home rider Tyla Rattray on top of the MX2 series. The Leatt Brace GP of South Africa is ready to take off. Defending MX1 Champion Steve Ramon of Teka Suzuki WMX1 is ready to enter Nelspruit after he made his podium comeback at Uddevalla to reinforce his second position in the Championship. Steve Ramon is the defending MX1 Champion. Though Yamaha Monster Motocross’ David Philippaerts leads the points standings in what is his first year with the works Yamaha team. Also the Italian was back on the podium in Sweden after a two GP absence. AXO KTM Silver Action’s Jonathan Barragan was on the podium with the MX1 leading duo in Uddevalla, where the Spaniard took his second season and career win. Barragan is experiencing a fantastic season and it looks like he has finally found the consistency he missed in the opening GP’s as he was on the rostrum three times in the last four GP’s. Max Nagl and Billy Mackenzie were also in form at the latest round in Sweden, where Steve Boniface led 13 laps at his only third GP appearance of the season. On the other hand Uddevalla was a tough one for Joshua Coppins, Sebastien Pourcel and Ken de Dycker, who will try to make up for that with a solid score in South Africa. 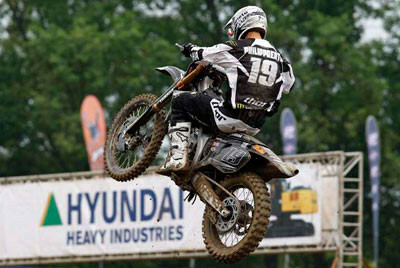 David Philippaerts is on top of the MX1 standings courtesy of his consistency. Someone who is expected to reach the podium by the end of 2008 is Belgian Clement Desalle, who might take his chance at Nelspruit after a solid sixth overall in Uddevalla. Red Bull KTM Factory Racing’s Tyla Rattray heads home to South Africa with the red plate under his belt, something the local fans will surely not miss this weekend at Nelspruit. After the latest injury plagued seasons, Rattray is as strong as ever and he has missed the podium just once this year, at wet Bellpuig. Tyla Rattray will be very welcome at Nelspruit. Yamaha Red Bull De Carli’s Antonio Cairoli will be there once again to make Rattray’s life difficult, as the Italian aims at grasping his third MX2 title after having won last year’s series. 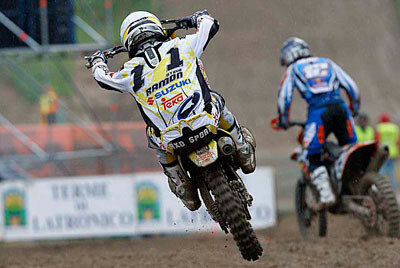 Cairoli was back to victory in Sweden and is currently second in the Championship with a 14 point gap from the leader. 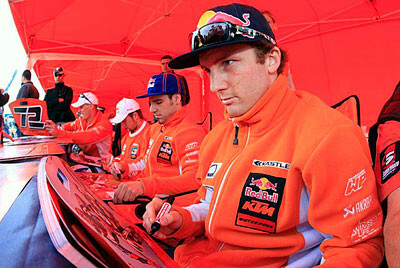 Other Red Bull KTM Factory Racing rider Tommy Searle is third in the Championship where he completes a very close top three made of those who will probably fight for the crown until the final round in Faenza. In fact KTM UK’s Shaun Simpson, who is fourth in the Championship, has a gap of almost 100 points from Searle and saw the podium only twice –the last time was in Uddevalla- while the trio were on the rostrum at least five times each so far. Tony Cairoli continues fighting for the MX2 red plate. Rui Goncalves and Nicolas Aubin round off the top six. While the latter recently dropped down from fourth to sixth in the standings, his French countryman Steve Frossard is working his way up through the field since his maiden podium from Germany. Saturday July 19: African Invitational Race (AIR) Free Practice 1 at 9:00 am; MX2 Free Practice at 10:00 am; MX1 Free Practice 1 at 11:00 am; MX2 Pre-Qualifying Practice at 12:00 am; AIR Free Practice 2 at 1:15 pm; MX1 Free Practice 2 at 2:00 pm; MX2 Qualifying Race 1 at 3:00 pm; MX2 Qualifying Race 2 at 3:45 pm; MX1 Time Practice at 4:30 pm; MX2 Last Chance Qualifying Practice at 5:15 pm (local time).